"Alexa, do I need to upgrade my media streamer?" You’d be forgiven if you thought Amazon had finished unveiling new hardware this year, after the company announced a barrage of new Echo devices (including a microwave) during its launch event in Seattle last month. However, Amazon has taken the wraps off a new Fire TV Stick 4K to complete its holiday device refresh, which introduces physical power, volume, and mute buttons so you can control compatible TV and soundbars with a single remote. The new Fire TV Stick 4K is powered by a 1.7GHz quad-core processor, which promises faster video streaming and quick loading. Like the previous iterations, the updated TV dongle plugs straight into the HDMI port on your television and offers access to Prime Video, BBC iPlayer, Netflix, as well as a slew of other apps and games designed for the Amazon-branded media streamer. The Fire TV Stick 4K includes support for Dolby Vision and Dolby Atmos when connected to a compatible home audio system. 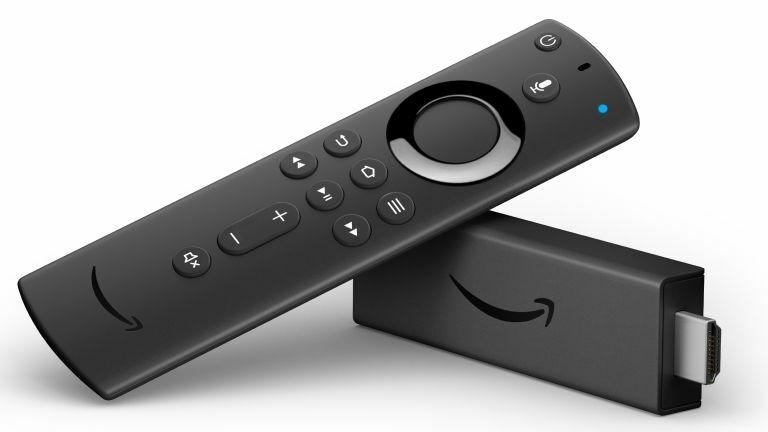 Amazon's updated Fire TV Stick 4K also ships bundled with a new Alexa Voice Remote, which aims to be much more of a universal remote than its predecessor. The new peripheral sports Bluetooth and multi-directional infrared, allowing viewers to control televisions, home audio systems, and satellite boxes with a single remote. Given the Alexa Voice remote's expanded remit, Amazon has added physical buttons for power, volume and mute functions. However, as the name suggests, voice commands are still the emphasis here. To coincide with the launch of the new Alexa Voice Remote, Amazon has added the ability to search for specific types of content using voice commands. For example, Fire TV viewers can ask: "Alexa, find 4K TV shows" to surface the latest Ultra HD box sets. The updated Fire TV Stick 4K is available to pre-order for £49.99 ($49.99) today on Amazon and will start to ship to customers on November 14, 2018. The updated telly dongle will also be available to buy in Argos, Dixons, John Lewis & Partners. Those who are perfectly happy with their existing Fire TV, but would like to get their hands on the new remote control can pre-order the Alexa Voice Remote separately for £29.99 ($29.99). It will start shipping on November 14, 2018 in the UK. Amazon is also offering a Fire TV Stick 4K and Echo Dot bundle for £79.99 – a £20 saving compared to buying the two Alexa-powered gadgets separately. “We’ve listened to our customers and pushed to deliver the complete 4K solution they are looking for, all within a compact stick form factor," said Eric Saarnio, Head of Amazon Devices for Europe. "Plus, the all-new Alexa Voice Remote lets you control your entertainment experience and use your voice to quickly find the content you want."